Well, I was thrilled to see that my little project from yesterday made one of the top three picks over at the Stampotique Designer’s Challenge. I was actually working on another one, as this is just my sort of thing, and I find the Stampotique images so very inspiring, in a quirky sort of way, so what is on my WW is another project that fits the bill for the challenge but as the challenge is closed and a new one is up (note to self: pay attention to the dates in future!) I can only post it here. First my desk – a mess as usual, but I am getting better about clearing up the remnants of an old project before beginning a new one. Maybe some day I’ll actually get better about cleaning my stamps LOL! Unlike so many tidy and detail oriented papercrafters I tend to make use of stuff I have rather that buying custom storage LOL! As you can see my handful of Copics are in an old coffee jar (although I did add a bit of cheap decorating tape around it to pretty it up slightly) and my little tape runners are in an old green tea box. 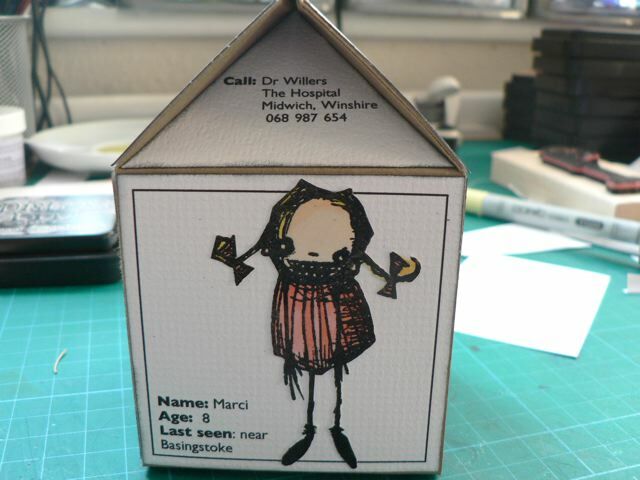 The project, which is more or less done (or will be by the end of the day) is using a milk carton template from Mirkwood Designs (they have a LOT of templates worth a look so do pop over if this sort of thing appeals to you) and is based on a few things – the HAVE YOU SEEN THIS CHILD? alerts they include on milk cartons in the USA to get the names and faces of missing children into the public eye, and the book The Midwich Cuckoos (also made as the movie Village of the Damned, a fairly good adaptation of the book, and not butchered like so many movie-from-book versions) The Stampotique images (most of which are linked to in the previous post, so I won’t do it again) lend themselves nicely to this sort of thing but I can already see the next challenge is going to be tricky for me as it is a card – and regular readers (do I have any? I sometimes wonder LOL!) will know I am not a natural cardmaker. I’ll explain some of the references – Rocky, buying a cuckoo clock, is clearly a reference to the title of the book. 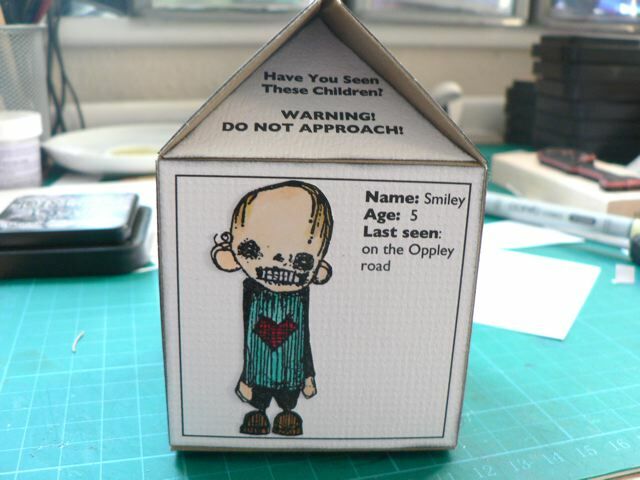 Smiley, on the Oppley road, is a location from the book. The Dr. is the doctor from the book and movie, and Marci was last seen near Basingstoke, near where I live. Buck (and the stamp is actually titled Uncle Buck) always makes me think of Uncle Duke from the Doonesbury cartoons, who is based on Hunter S. Thompson, who wrote Fear and Loathing in Las Vegas, hence Buck being last seen on his way to Las Vegas. The cow is from the Ikhioogla font (I believe it is the lower case a in ikhiooglacows.ttf) and the MILK font is JeannieShrimpton from girlswhowearglasses but not sure it is available anymore as a freebie. It was once available from Banana Frog as a stamp in a couple of different sizes but I can’t seem to find it in the catalog, so maybe not any more. Shame. It’s one of my all time favourites. I spend a stupid amount of time researching the format of phone numbers in the UK in the 1950s so I could get the phone number correct but never did find anything that helped. So that one is just made up LOL! I am determined to visit as many posts on WOYWW as I can this week, having missed out last week completely, posting AND visiting. 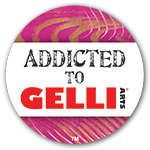 Off to make another cup of coffee to fuel my clicking then back to it! Cant wait to see what everyone else is working on. 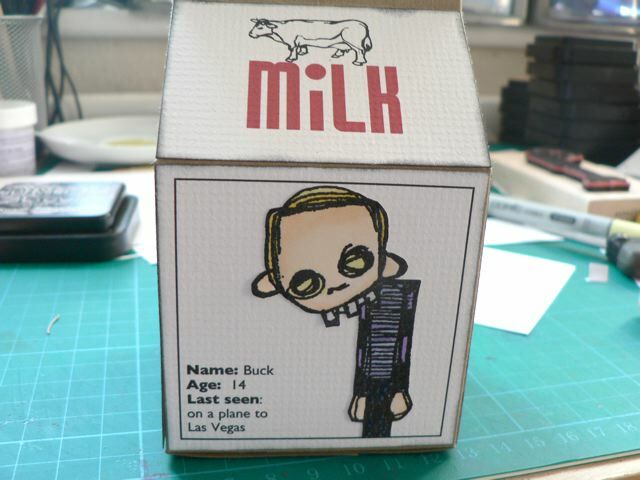 I’m really late to visit but I love the milk carton idea, how cool! My daughter says she’s at College with Marci.! What an absolutely brilliant projet – I LOVE it!!!! Superb unique ideas! Thanks for showing us all yoru crafting space! 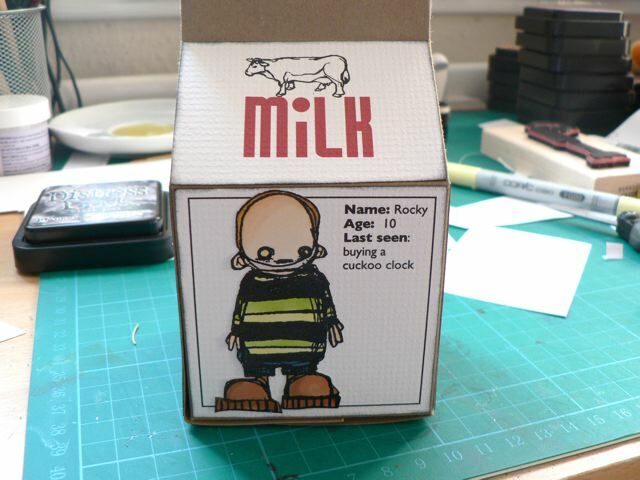 What great projects, brilliant take on the milk cartons! Love it!!! This makes me want to make one of these for my 3 kiddos!!! 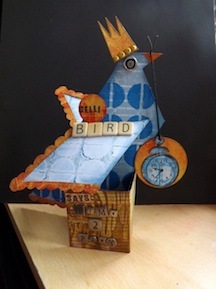 You did an excellent job and thanks so much for playing with us at Stampotique Designer’s Challenge and so glad you are enjoying the stamps and challenges! Your project is WONDERFUL!!!! Love what you have done with our crazy images. Fun stuff! OMG! I got it right? I must be on a roll this week LOL! I think this is fabulous, but a often wonder when I see these wonderful works of art, what happens to them next!?? Love those stamped images. I bought some really inky ink the other day, which is soooo inky I can’t really use it,unless I smother it with embossing power and then it’s all thick and black, would look great with thee images tho’! Have a crafty day! Hope I’ve put all the things in the above boxes in the right place this time! no…. I’ve put my email in the box that sez email….. try again! I just love your cartoons, really good. Congratulations on your project yesterday getting into top 3. Good luck with getting round all the blogs on WOYWW…..I think it will take me a week but will try. This is the first time that I have done anything like this and think its lovely, everyone letting you see what they are up to. 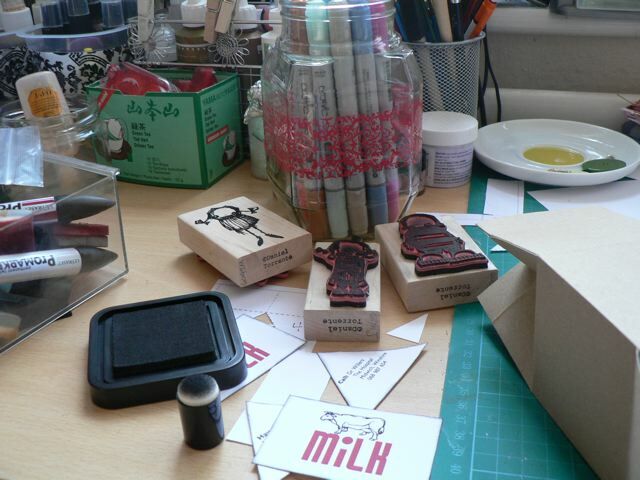 Hopefully I will be crafting by next week and my desk will be back to normal. Fantastic projects, love those Stampotiques and well done for last week! oh mary~anne i love your milk cartoon…’tis brilliant! wow, what a fabulous project!! !